The following essay is reprinted with permission from Duke Anesthesiology at Duke University School of Medicine. 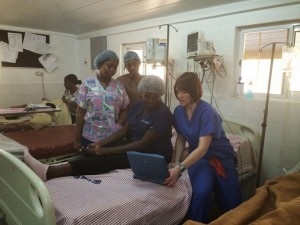 Chief Resident, Kayla Bryan, MD describes her trip to Africa as part of the ongoing Global Health mission of Duke Anesthesiology. I had been looking forward to January 2015 for over a year, and I was not disappointed! 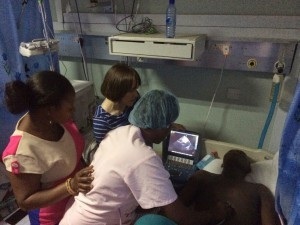 I spent the month in Ghana, Africa, working as part of the Kybele team improving the care of maternity patients at Ridge Regional Hospital in the capital city of Accra. Each day at Ridge Hospital presented a new experience or a new challenge. Sitting in on OB morning reports and observing patient care on the wards and in the postanesthetic recovery units gave insight into the daily challenges experienced by all staff at the hospital. Medication and equipment shortages, staff shortages, power outages and patients’ inability to pay are common occurrences that significantly impact maternal morbidity and mortality at Ridge. My project while at Ridge Regional Hospital centered around using bedside transthoracic echocardiography in a low resource country to improve the care of critically ill maternity patients. We brought a portable ultrasound machine from the United States generously loaned to us by Sonosite with plans to perform echocardiography on patient volunteers. However, once I unpacked the ultrasound machine on that very first day at the hospital, many of the Ridge staff lined up as volunteers so we could practice TTE. We were amazed at the enthusiasm expressed by physicians, house staff, nurses and students alike! As the month passed, we continued performing echocardiography on both staff and patients improving our skills and teaching anesthetists, intensivists and nurses along the way. While in Ghana, I was given the special opportunity to fly to the northern city of Tamale, which is much smaller and more rural than Accra. The Tamale Teaching Hospital was larger and more updated compared to Ridge Regional Hospital; the operating rooms, intensive care units, and labor wards were better equipped with new anesthesia machines, monitors and surgical instruments. 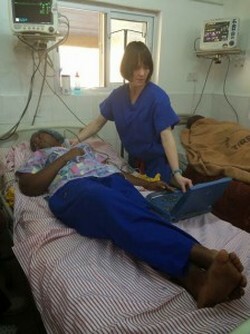 However, in Tamale, many patient beds were empty, and state-of-the-art equipment wasn’t being used. At Ridge Regional Hospital, patients lined the sidewalks daily waiting for beds to become available, and the maternity and female ward censuses were always at capacity. The differences in the two facilities were tremendous. While in both Accra and Tamale, I was teaching nurse anesthetist students who were all extremely bright and eager to learn. It was very refreshing and rewarding to teach such appreciative groups of students. We worked hard while in Ghana, but we also took time to experience the culture and beauty offered by the country and its people. The art markets and rainforests were amazing, but neither came close to the kindness shared by the Ghanaian people. My birthday came and went while I was in Ghana. This was the first surprise birthday party I ever had, and it was magical! There was birthday cake, candles, sparkling grape juice, and more singing and clapping than you can imagine. 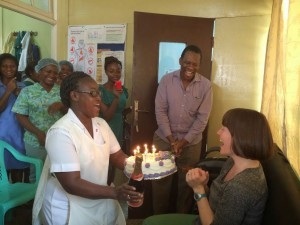 Dr. Olufolabi, Amy Mauritz and the staff at Ridge Regional Hospital gave me a birthday I’ll cherish for the rest of my life. Before traveling to Ghana I knew I was interested in global health, but I didn’t have any understanding of what global health actually entails. After spending an entire month immersed in the healthcare system of a low resource country, I now have a much better understanding of the complexities and difficulties encountered while trying to improve patient care in these areas. Global health encompasses a wide range of interventions, personnel and emotions. Adaptability is paramount as is teamwork and compassion. While in Ghana, I experienced wonderful emotional highs as well as many devastating emotional low points. My perspective has changed forever, and I cannot image my career going forward without global health playing a role. I am extremely grateful to Dr. Olufolabi, the Department of Anesthesiology at Duke University Hospital, and Kybele for enabling me to have this wonderful, life-changing experience.